Why Are Parents Giving Their Middle Schoolers Alcohol? 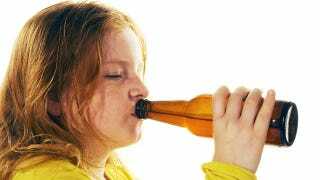 A new study by the U.S. Substance Abuse and Mental Health Services Administration found that about 5.9% of 12- to 14-year olds have had alcohol in the past month, Business Week reports. Even more surprisingly, the study found that giving allowance money to that shady guy who hangs out by 7-11 isn't kids' preferred method of obtaining liquor. Almost all of the kiddie drinkers got the alcohol for free, and about 45% got it at home. About 15% stole the liquor without their parents' knowledge, but 15.7% were given alcohol by their parent, and another 14% got it from a relative. "Anecdotally, parents say, 'Well, at least they are drinking at home and not on the street, or at least they are not smoking marijuana' — all kind of silly things," says Peter Delany, director of the Agency's Center for Behavioral Health Statistics and Quality. According to our own anecdotal evidence, most high school upperclassmen have a friend whose parents look the other way while they knock back Smirnoff Ice in the backyard. Many parents aren't concerned about their kids trying alcohol before they're of legal age, but acknowledging that your college freshmen drinks is a far cry from letting a 6th grader have at the vodka. According to Delany, kids who drink before the age of 15 are about five times more likely to have a serious alcohol or drug problem by the time they're 21. He says the best way to combat the problem is to to "start talking to our kids about this issue," but if these are the same adults who are already giving their middle schoolers liquor, it doesn't seem like talking will do much good.